At one time, an older version of this system sold for over $1200 for the big contract system. With the contract split by 5, we have decided to split the big contract system price by 5. The new price is 25 percent less than recently. Only $255 (plus S & H) for the detailed manual and locked Tradestation code. For the programmers, it is $355 (plus S & H) for the detailed manual and the OPEN Tradestation code. Both versions are fully detailed - WHITE BOX. Paypal ordering for V-Based 1.1 system is shown at the bottom of this page . Wild day in ES futures here. If you knew the trend and what to look for, it was full of opportunities. First, price gapped up open with no or very little follow through. Price fell back to the open and bounced. This bounce took it right to a key technical area - the low of the high bar. Price rejected this area fast and fell hard. Right through yesterday's close and the intraday lows. Price congested around 11:00 then had a Four Close Reversal up. This could have been bought for a quick turn. Price penetrated the previous pivot high. Is this a turn? ES then grinded lower to, you guessed it - the high of the low bar. A tight double bottom formation developed here. A buy could be taken on the breakout after 1:00. This is for educational purposes only. Not a recommendation. The market moves in up and down waves of 3 to 5 days. It doesn't move in a straight line. Our "Price Trend Indicator", PTI, identifies overbought and oversold conditions. We teach this indicator to you in the system manual. Overbought markets are candidates to sell short. Oversold markets are long candidates. 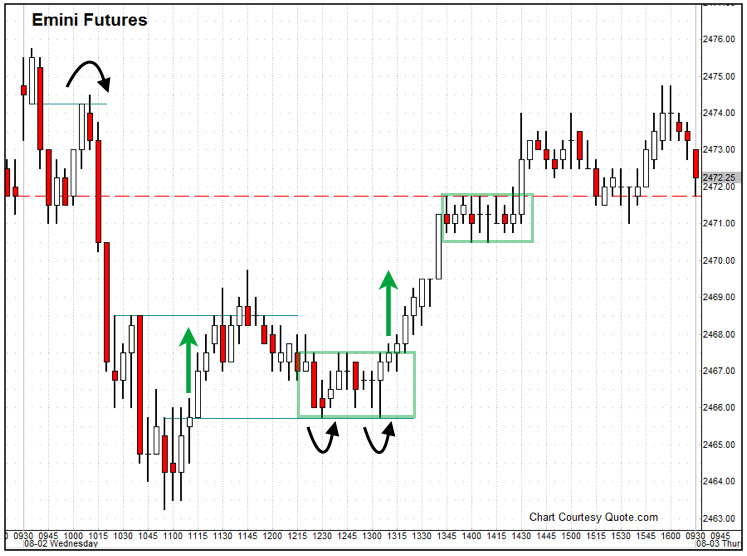 Our first trade entry method is an "opening range breakout". We will buy a certain distance above the open and sell short a certain distance below the open. In overbought conditions, as identified by the "PTI" indicator, we move the sell entry in tight and the buy entry moves farther out. Making it easier to sell an overbought market. The opposite applies to oversold markets. 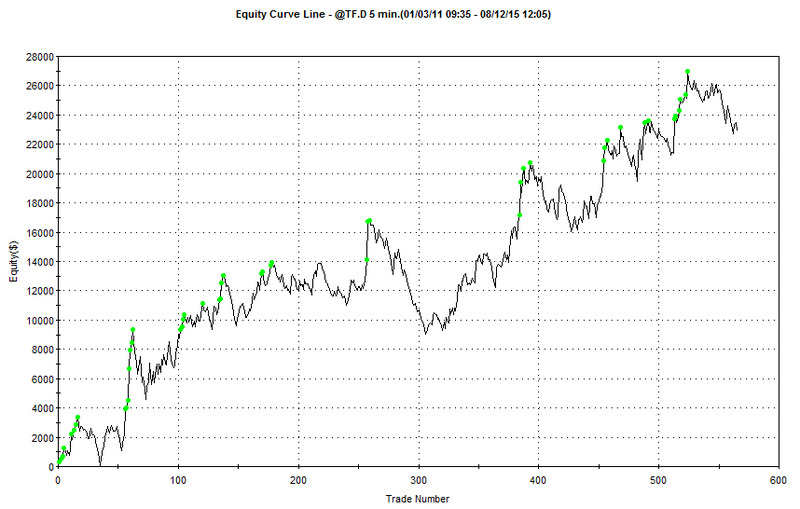 Our daytrade system is a simple, logical design. Volatile markets can cause the trend of the day to change direction. We feel this is most likely to happen at the highs and lows of the last three or four days, or after gap openings. These are sometimes labeled "key reversal days". Our "Superior Clear-Out Reversal Enhancement" entry tries to identify these reversals and get in the trade as the new move begins. Finally, the risk of trading changes everyday. So should your stop losses. Our system uses "Dynamic Risk Exposure Stops". They will change everyday as the risk of trading changes. These are also detailed to you in our trading manual. V-Based 1.1. Original system released March 1997.
" 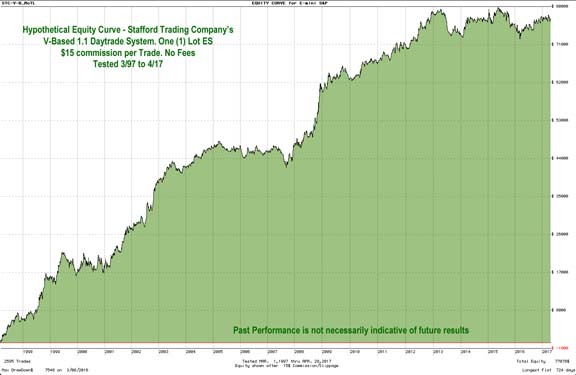 System for Daytrading Stock Index Futures"
Hypothetical Results tested March 1, 1997 to April 30, 2017. One Lot ES Mini. Of course, PAST PERFORMANCE IS NOT NECESSARILY INDICATIVE OF FUTURE RESULTS. No Fees. $15 deducted per trade for slippage and commissions. One Lot ES Mini S and P.
Hypothetical Performance of the STC V-Based 1.1 ES Daytrade System. Click on equity curve for larger image. V-Based 1.1. Original system released March 1997 as a S and P 500 stock index daytrade system. Here is the hypothetical performance on the big contract before the switch to the ES mini contract. Hypothetical Results tested from original release of March, 1997 to switch to ES mini around December 31, 2010. One Lot Big SP. Of course, PAST PERFORMANCE IS NOT NECESSARILY INDICATIVE OF FUTURE RESULTS. No Fees. $75 deducted per trade for slippage and commissions. 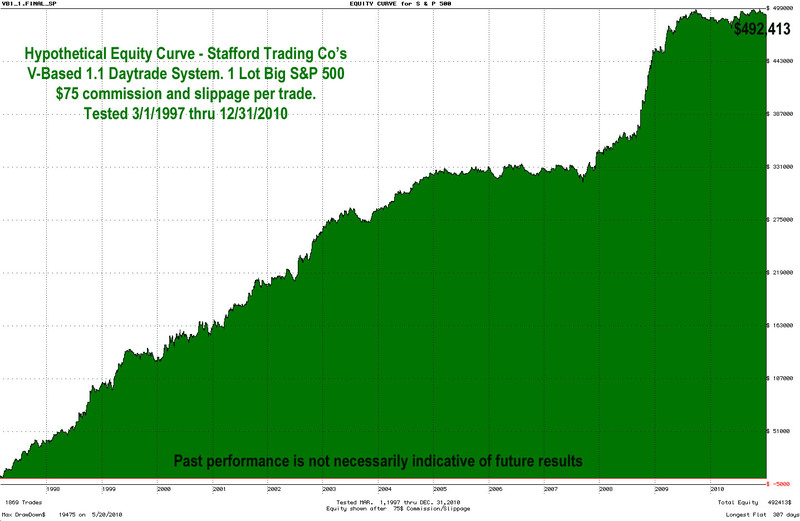 One Lot Big S and P.
Hypothetical Performance of the STC V-Based 1.1 Big SP Daytrade System. Test reflects hypothetical performance on 1 contract of the Mini Russell contract. Hypothetical Performance of the STC V-Based 1.1 One Lot Mini Russell.